The lamp went into endurance test on 28 Jan 2014 and this reporting covers until 14 Oct 2014. The the test went on until mid Jan 2015. During this period of time the lamp has seen the following variation in enviromental temperatures and humidity: the temperature close to the lamp varied between 8 – 30 deg C and the humidity betwen 25 – 80 %. The tube has been in a garage. The variation of the lamp parameters during the endurance test. See the explanation on the OliNo site for more on the test method. 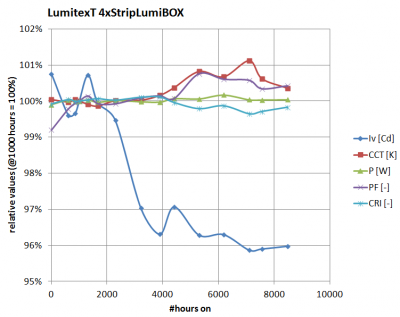 The extrapolation to the 70 % level of the luminous flux is possible when using the illuminance as a measure for the luminous flux (the level is basically constant). See the explanation on the OliNo site for more explanation and the link to the ASSIST document for the method of extrapolation. 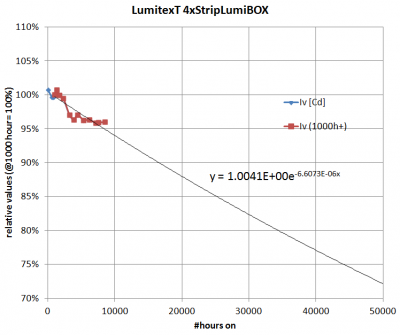 The extrapolation of this data until 70 % of illuminance is reached goes beyond the 5 – 6 x the tested time, so the 70 % luminous flux quantity is expected to happen after 50,000 hours. The color change (change in color coordinates) is measured during the first 8,400 hours. Change in color coordinates during the endurance test. The color coordinates indicated with the red cross-hairs are the coordinates after 1000 burn hours. These are taken as reference. 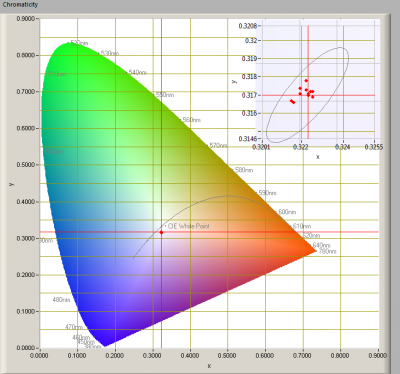 After 8,400 hours the color point remains well inside an 1-step McAdams ellipse. This is a very good result for constancy of color.